Poverty is evident all over the world. There are homeless people roaming the streets even in progressive countries, what more in struggling third-world nations that are often riddled with problems of inequality, corruption, lack of opportunities and political unrest. Unfortunately, there are many countries now in the world that fits the description. If you haven’t heard it in the news yet, famine continues to ravages several African nations. Widespread poverty is one of the triggers of famine. Famine is often unheard of in civilized countries because the government can always intervene and prevent it from happening. However, many people die of hunger from various African places you haven’t heard of. Aside from the issue of war, climate change likewise has a big role as to why famines happen and persist in the first place. 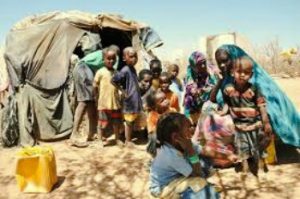 “Where people exceed food supply, widespread hunger and famine results and many may die as we have repeatedly experienced in many countries, particularly in the Horn of Africa. The complexity of the hunger debacle in Africa also incriminates many factors apparently unrelated though intricately intertwined. Population control and management are needful. There are just some levels or limits to which new houses, schools, stadia, roads, railways, airports, markets, recreation grounds can be established. “Each country has a fixed land space. Space determines the carrying capacity as regards food production hectares. Import of food that depends on the hard earned foreign exchange is risky when funds dry up. If the human population fills her territory, migration becomes inevitable. The days of empire expansion through the power of might is long past,” he said. Akoroda, a professor, in his presentation, ‘From Hunger and Starvation to Sufficiency: Proffering Solutions to Africa’s Predicament’, charged Nigerian governments to endeavour to abide strictly by the Maputo Declaration for African Union countries which stipulated spending at least 10 percent of their national budgets on food and agriculture, noting that this has continued to remain a mirage due to neglect, ignorance, and inaction. “The result of not heeding such proposition has not helped us in reducing or removing hunger fromAfrica,” Akoroda lamented. Hunger is a big problem in Africa. The land is all dried up and no crop can ever grow anymore. Water is scarce as well, so people had to rely on government rations to survive. Unfortunately, not everyone can make it so the body count keeps on increasing until now because the issues on famine haven’t been solved yet. Nigeria, Somalia, South Sudan, and Yemen are suffering from a famine that affects 20 million people. According to eVolo magazine, over 40 percent of people living in sub-Saharan Africa live in extreme poverty. In the last three decades, absolute poverty has been reduced from 40 percent to 20 percent worldwide. Unfortunately, the green revolution including clean energy, fertilizers, irrigation, and high-yield seeds that doubled grain production between 1960 and 2000 on other continents has failed multiple times in Africa due to limited markets, bad infrastructure, civil wars, and an ineffective government. The eVolo magazine presents and discusses architecture embodying technological advances, sustainable concepts, and innovative designs. Each year, eVolo hosts a competition and awards the structures that they admire most. This year’s top prizewinners were two Polish architects, Pawel Lipinski and Mateusz Frankowski. They designed the Mashambas Skyscraper which houses a farm, an education center, and a community center. The ingenious structure facilitates the training of subsistence farmers in modern farming techniques. Providing the farmers with inexpensive fertilizers and state-of-the-art tools enables them to increase their crop yields dramatically. The skyscraper also creates a local trading area, which helps to maximize profits. The objectives are self-sufficient farming and overcoming poverty and famine. Vertical farming is one of the options considered by experts to help solve the famine issues the world over. Moreover, the lack of agricultural space is no longer that big of an issue when you can plant a lot of crops on a small piece of land. The population is exploding, so the food supply should be able to catch up as well or else many people will end up hungry and sick just like what is happening now in Africa. For years now, these poor African nations have relied on non-profit organizations for assistance but the increasing armed conflict in the region make it difficult for help to arrive. Also, other parts of the world are ravaged by disasters as well and are the reason why donors’ money and other resources are stretched thin and only a small portion gets to Africa. If only armed conflict won’t get in the way of help, perhaps it can save countless lives and people no longer have to suffer from hunger any longer.